Ulefone Armor 2 has been officially launched. As the name implies, this phone is a very strong phone with a full armour. 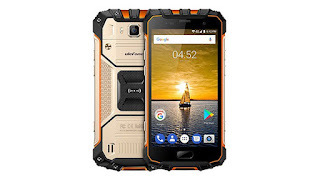 According to the company, the phone body is made up of TPU, glass fiber reinforced polycarbonate material and metal, and is also IP68-certified, making it heat-resistant, cold-resistant, Shockproof, pressure-resistant, water-resistant, and dust-resistant. Ulefone Armor 2 is powered by Helio P25 octa-core chipset clocked at 2.6 GHz, features 4G LTE network with 16 different LTE bands, fingerprint sensor, non-removable 4700 mAh battery capacity with fast battery charging. There's also a massive 6GB RAM + 64GB internal memory, runs on Android 7.0 Nougat, 16MP rear camera with LED flash. The phone is built like a tank after all. Have a look at the full specs and and price below. Launch Price: $299.99 USD / CNY 1,945 / INR 19,188 / NGN 108,000. Hmmmm, nice phone with good specifications. This phone has almost everything we are talking about regarding phone, this is good phone. As great as this phone is. Missing some 4g bands. Especially tjose that will work with glo 4g.great specs all round. mehn this phone issa bomb, all the specs are confirm and activated, but wait o i came to discover that most of this unpopular brands makes more of a shocking phones with great specs for affordable price, compared to the popular ones that have already flooded the market.